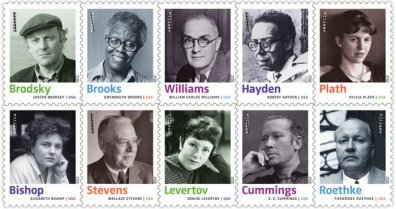 On April 21 the United States Postal Service will issue a set of 12 stamps depicting twentieth century poets. Included among the poets selected to be so honored are four that were appointed by the Library of Congress as Consultant in Poetry, now called Poet Laureate. The four and the dates they served in this position at the Library of Congress are Elizabeth Bishop (1949-50), William Carlos Williams (1952, appointed but did not actually serve), Robert Hayden (1976-1978, first African American to be appointed), and Gwendolyn Brooks (1985-1986). Previously Robert Frost (1944-45) who served as Consultant in Poetry appeared on a postage stamp issued in 1974. Honored on a postage stamp in 2005 was Robert Penn Warren. Warren served as Consultant in Poetry in 1944-45, but also had the distinction of being designated as the first official Poet Laureate in 1986-87. Click HERE to see all of the postage stamps that are currently planned for issue in 2012. The Library of Congress has a section of its website devoted to past Consultants in Poetry and Poet Laureates with short biographies of each. I am always hopeful that at some point the USPS will actually issue a postage stamp honoring a librarian or librarians for their service in the library profession. With the recent decision by the USPS to make living Americans eligible to appear on postage stamps that seems unlikely (it's hard enough to compete for this honor with the dead much less the living). I have a link on my Library History Buff website regarding the possible depiction of a librarian on a postage stamp. I also have a list of "library people" who have been honored on U.S. postage stamps for reasons other than being a library employee or supporter.